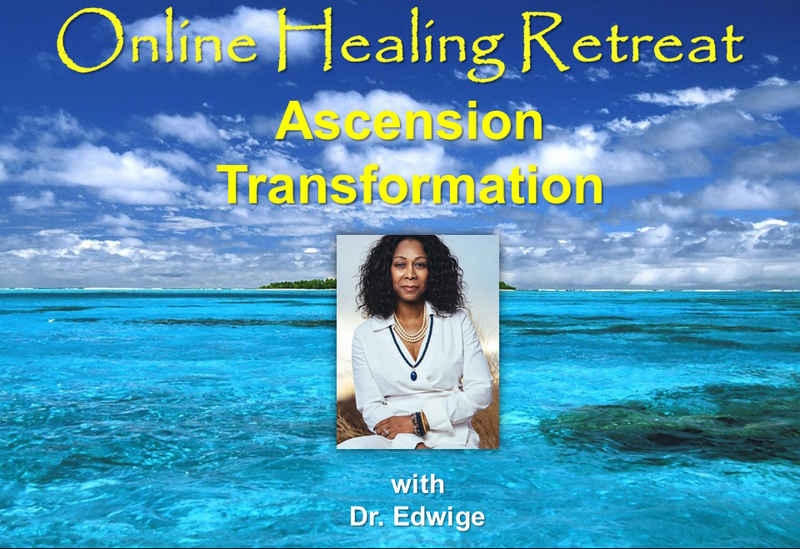 Experience 3 Energetic Sessions (over 2 hours each) with Dr. Edwige who covers the Ascension Transformation and the 3 phases: Transmutation, Transformation, Transfiguration with understanding the Rays of God that apply to each as well as prayers, principles and tools of mastery. one must travel to be ready and prepared for your own ascension.. It does not matter what experiences you have, as long as you stay in your heart and allow your Higher-Self to be your guide. However your awakening happens, know that it is perfect. Let me emphasize the importance of your willingness to let go of the illusion that events and circumstances are supposed to happen a certain way. Your authentic awakening requires you to embrace the notion that there are components to the process based on trust alone. Surrendering is where you will discover and become your authentic, true self. We came forth to master the opposite of what we were Divine aspects of Source. But to do that we had to take on these badges of lack, limitation, fear, guilt, shame, poverty consciousness, pain, doubt, suffering, oppression, you name it all of the qualities on the dual side of Divinity. Lifetime after lifetime of taking on these qualities caused us to forget our true nature, and force us to work through these limiting beliefs. The goal is to evolve the species of man, and at the allotted time we would wake up since our DNA is programmed to do so, and we would begin to remember who we are, or at least begin to ask questions to that effect. Next, the work would begin; you must transmute what no longer serves you and release it, and remember you are as I like to say a “Unit of Divinity”. Why is it so difficult, well, the programming was really convincing, we believed the illusion to be true, and these beliefs have seeded all the way to our core, making it much more difficult to wake up than originally planned. Let go of dysfunctionality: guilt, fear and shame utilizing the First Ray of God: The Divine Will. Understand the Stages of consciousness that you must go through to evolve and master the art of letting go. Whether you accept this truth or not at this time, because you have or have not experienced it, its truth may still resonate with you. There is more to it than just knowing it; it’s a matter of living by it. To intuitively sense the truth within, is not enough. While we may live each day knowing the truth, our days will not be as good as when we are living each day by the truth and that truth transforms us. We move into alignment of our Higher-Selves and begin turning on our DNA. Veils will be lifted and our gifts will reveal themselves to us. Improve your one to one connection with your Higher-Self and the Divine. Work with Ray two, Divine Wisdom to transform your body, mind and spirit. Become the detach observer allowing more of your soul to move through you with ease. “I AM MY LIGHT BODY RIGHT NOW”. This is a concept that you must embrace to fully step into your power. As we become more aware of our divine truth and accept that we are a part of the greater whole we begin to expand. This expansion then allows us to receive more light activating more of our GOD DNA and dormant codes needed for Ascension. Once we have raised our vibrations and frequencies high enough we can then receive and experience our light body descending into us. And live a life that is more in alignment with our divine soul purpose and aligning us for our I AM Presence to anchor more fully into our body systems. Work with the remaining Rays that teach us the major qualities of the Universal Christ, qualities which the serious spiritual student needs to embrace. It is important to realize that as human beings we come into body with at least six rays within our structure of the Personality, Physical Body, Emotional Body, Mental Body, Soul and Monad. You can have more than one ray in each of these aspects also. So we are already working with the frequencies of each of the rays which is very important. What many individuals do not realize is that in order to be in full mastery you must be able to command the rays, for it is a pre-requisite of a 7th dimensional initiate and Earth is a 7th dimensional planet. It is time to shed the old you and move past you fear of losing yourself in the awakening. Surrender and allow yourself to expand and become all that the Divine has for you.